Ok, so I am going to blow the secret wide open. 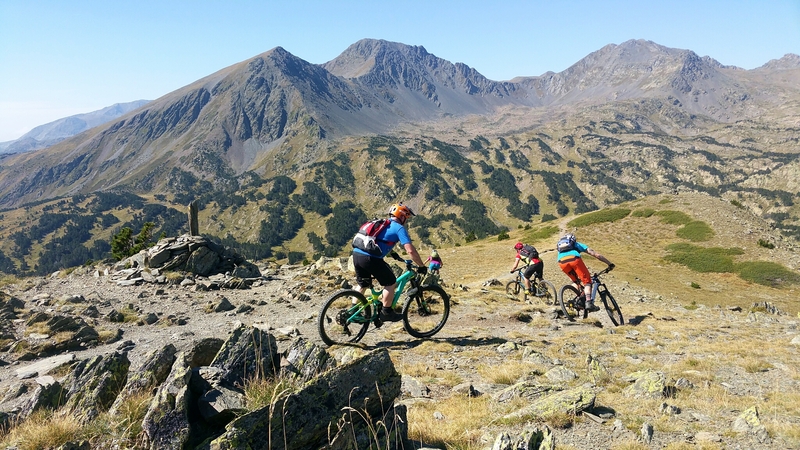 The Pyrenees Orientales is a mountain biking paradise, one of the best kept secrets in the mountain bike world. There, it is done, said, out in the open…. For those of us in the know there is an unfathomable amount of mountain biking potential here. 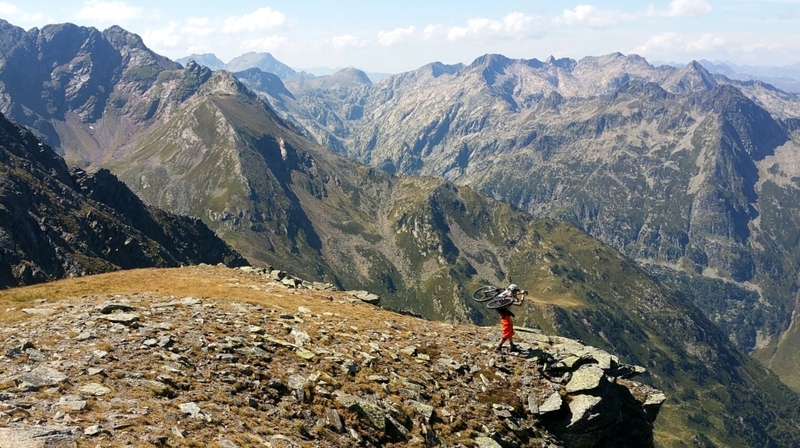 Between the summits and the sea you can ride to your heart’s content on trails suited to all abilities. Thousands upon thousands of kilometres of waymarked and non-waymarked trails. To make things clearer, in France there are two types of trail: those open to motorised vehicles and those not open to motorised vehicles. As a mountain bike is not a motorised vehicle, you are free to ride your bike on any path, waymarked or not. When I asked an ONF forestry worker friend of mine if there were trails that we couldn’t ride on, he simply replied: “well yes, those that are too difficult….”. This leaves plenty of potential. Essentially there are three types of mountain biker. Firstly those that like to only go downhill with lifts to get them back up. Secondly those that like to ride cross country trails and this category includes everything from families to long distance trail riders. Thirdly those that are happy to do anything to access those out of the way, hard to reach gems hidden in the mountains generally needing a high standard of cross country fitness and downhill technique on natural trails. Here in the P-O we have some very good downhill bike parks. Les Angles ski station offers trails with lift access using its gondola from mid-June to mid-September. 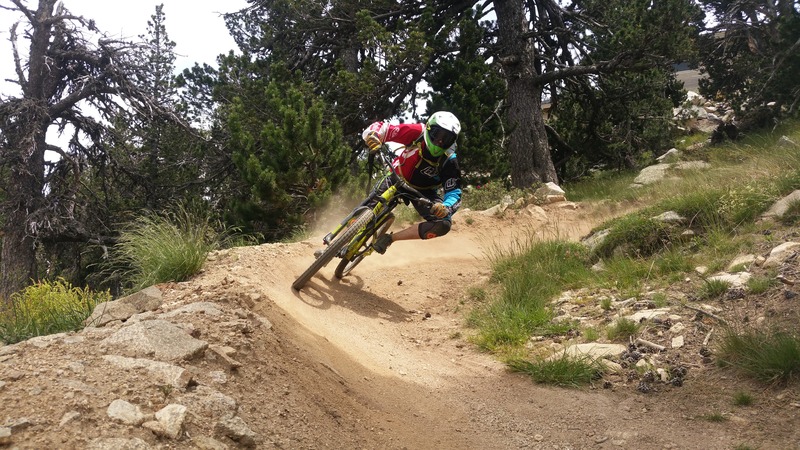 La Molina ski station, just across the border in Spain, offers the same gondola-accessed trails, and in Andorra there is the world famous Vallnord bike park and a second bike park at Soldeu. 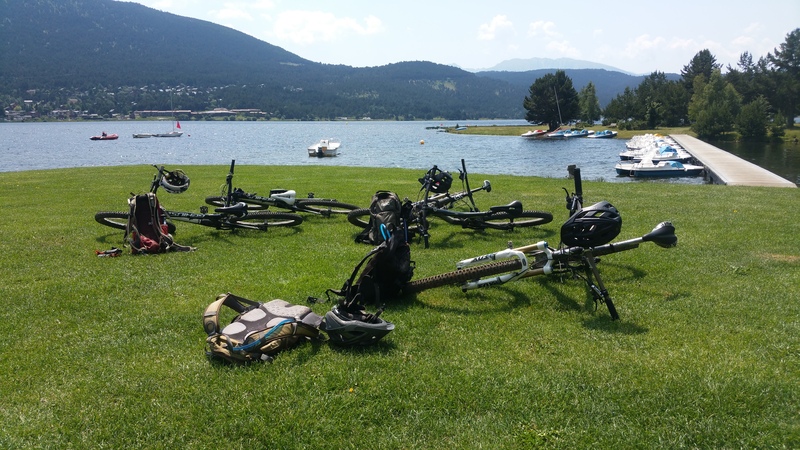 I know the idea of taking a lift up and screaming down the mountain appeals to many, but, a word of warning: do not just turn up at one of these bike parks, rent a bike and a helmet and think it will be plain sailing. These places require a certain level of skill and ability; injuries (some serious) are commonplace, so if you are not sure of your ability, get an instructor to show you the ropes. It is not for nothing that full face helmets and back protectors come as standard protection! This is a huge segment. Let’s start with family mountain biking. One of the best areas for families with kids of all ages to get out and ride on some beautiful trails is the Capcir valley. Using the main parking area at Lake Matemale also opens up the potential for non-riding family members to partake in one of the many other activities on and around the lake, from high ropes to canoe rental. There are many trails heading out from the parking. The Office de Tourisme at La Quillane can supply you with a trail map giving the numbers of the arrows to follow for trails of all levels. Just like skiing, trails are given levels green, blue, red and black with green being the easiest. 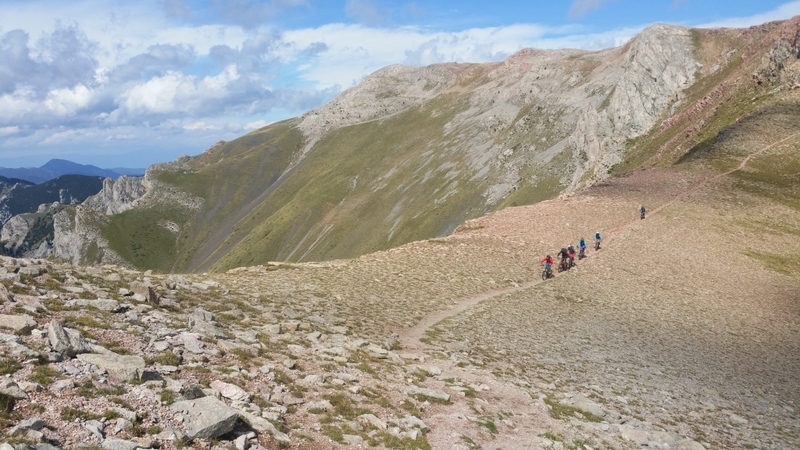 For those of you looking for more action, the trail map has over 700km of trails marked throughout the Cerdagne , Capcir and Tet valleys, so get busy! If you need to rent a bike there is also a hire center at the lake. For those of you that like the idea of a bike with some assistance, electric mountain bikes can be rented at the Col De La Llose cross country ski station. For more information on the trails and bike rental stations, click here. When you hire your bike ask the rental guy to switch your brakes to UK style as grabbing a handful of brake in an emergency only to find that it is the front brake is a nasty surprise. Remember this is mountain biking so wear a helmet! Get a guide! It will save you an enormous amount of wasted energy and time. The trail options are endless and the guides know how to get you to the best of them, and how to get home again afterwards! These trails are not waymarked and sometimes not even on the map! You will need a good level of skill, experience and fitness, but the rewards are awesome. You can ride anything from a one day epic with over 2000m of natural singletrack descent to a multi- day voyage on incredible trails from the “summits to the sea”. Don’t forget to carry drinks, snacks, a pump and spare inner tubes. Carry your phone and a waterproof jacket because if you have a problem or the weather changes these could save you a lot of unnecessary problems. 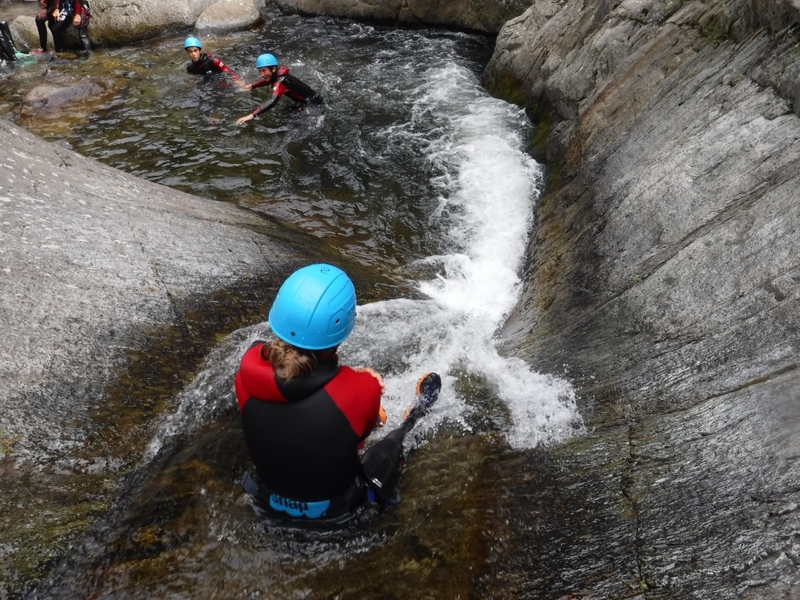 Canyoning: mainly done nearer to Prades in the Yech and other canyons. This is a fantastic day of thrills in stunning natural environments. Contact Stephane Roucal (Tel. 0681898991) to get one of the nicest guides out there. Zip lines: head to Llo or at Porte Puymorens to get your kicks whizzing from cliff to cliff on zip wires. High adrenaline fun! Hot springs: for some relaxation after your efforts, the hot spring spas at St Thomas les Bains, Llo, and Dorres make for a great treat. The water is heated by natural hot thermals providing a multitude of health benefits as well as soothing any aches or pains. Yellow Train: from Villefranche de Conflent to La Tour de Carol, take the beautiful journey through historic villages on this incredible railway line. Whatever you choose to do, the P-O is a treasure trove of outdoor activities and with spring in the air, now is the perfect time to get back to nature. Une capote anglaise……a french letter !